The ‘don’t move, improve’ approach to gaining more space is still a thriving idea among homeowners. If you’re happy with your house, don’t want the upheaval and expense of moving, but could do with an extra room or two, it makes sense to maximise what you have. But if you have already extended out and converted your loft, what next? The only way is down! Converting a basement is a brilliant opportunity to gain valuable additional space and can often add as much square footage as the floor above – sometimes even more. Better still, the new-style basement is no longer simply overspill space for a dingy utility or cave-like teen hangout, it is a beautifully designed, light-filled room and, as these images demonstrate, can be used as anything from a bar to a bedroom. A great big basement space with room for games, seating and big pieces of kit, such as a snooker table, is a treat for a family. This room is biased towards older kids, but a tots’ basement is also a great asset, providing a dedicated area for messy play away from the rest of the house. This mural, commissioned by the owners and featuring all the family members, makes a wonderfully personal wall decoration, and brings bold colour to a space low on natural light. 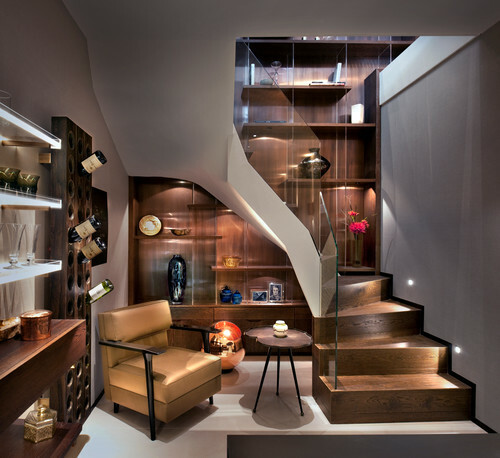 In a contemporary basement conversion, the stairs down are often just as much of a design statement as the room itself. 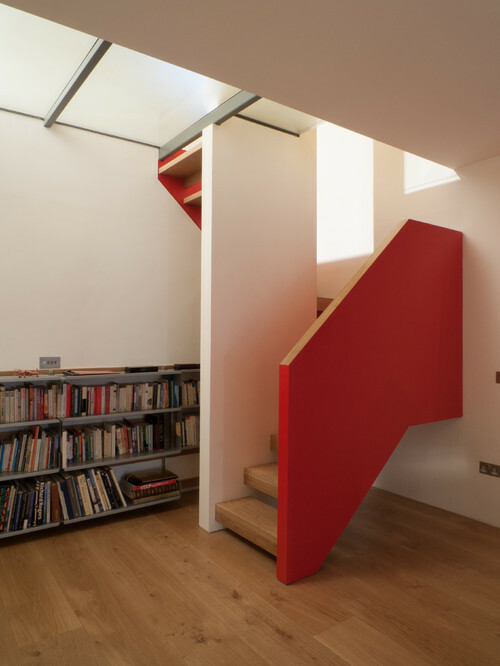 Here, a simple space is brightened up with a solid banister in strong red, creating a slash of brightness running up to the floor above. A small-scale basement conversion lends itself to use as a smart retreat for reading, enjoying a drink or quiet contemplation. Here, touches of dark wood create a club-like feel without sucking up too much precious light, while recessed spots over shelves and by the stairs give the space a subtle, soft glow. 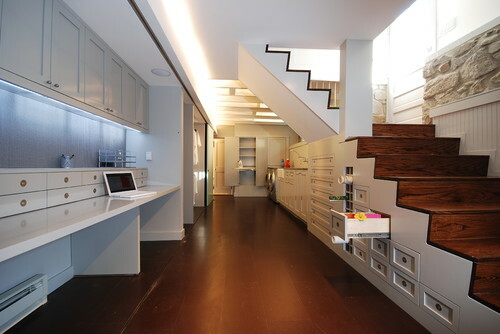 A wall of built-in shelving cleverly links the two floors, helping to connect the basement to the rest of the house. 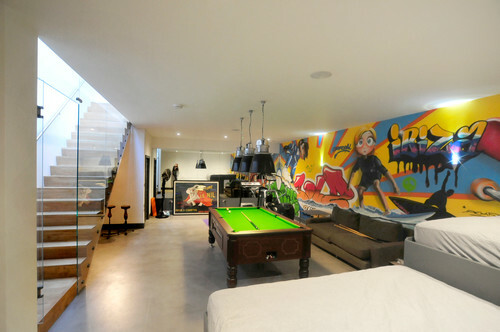 Basements are often home to those rooms that are not strictly necessary, but are a whole lot of fun! 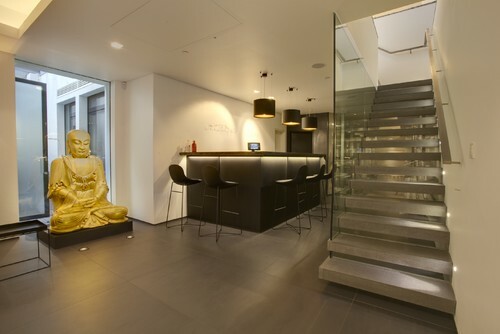 Here, a bar has been installed in this minimal, sleek space, perfect for evening entertaining. Basement rooms were often used as playrooms in the past. The fact that they are slightly out of the way was seen as a chance to let it all hang out down there, style-wise. Of course, it doesn’t have to be that way, with stylish basements so much more than overspill space for a growing family. 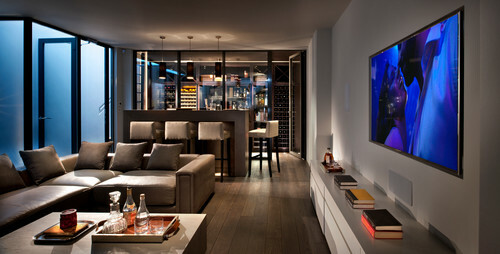 This gorgeous, grown-up room is designed for adults, and includes a large flatscreen TV, a bar and a wine cellar. Cellars were traditionally located below stairs, where temperatures are cool, but those dusty, cobwebby spaces are now being redesigned, with purpose-built wine cellars available as a luxe addition to a home. You can still put them in your basement, though! Why drive to your local multiplex when you can stream a movie straight to your basement? 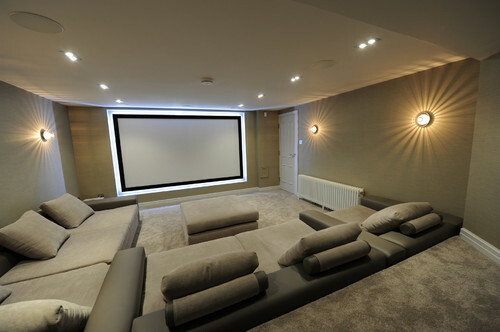 This space is all about film watching, so the décor is minimal and muted and the seating is super comfy. Take the games room idea and ramp it up, creating a fully functioning sports room below stairs. Now bad weather or a busy schedule need not stop your child from practising penalties or perfecting hockey strikes. If your basement will be used primarily by your kids, make sure it meets all their needs. Space for games, TV watching and socialising is essential, but why not build in neat, dorm-style beds, too, for mega sleepovers and lazy reading sessions with siblings and friends? This huge room, light and airy thanks to doors that open onto stairs up to the garden, can sleep six in a relatively compact space. With many of us working from home these days, a dedicated office space is an essential ingredient of our homes. Time to convert the basement into a work space, then, with built-in desks and masses of storage. This clever design includes drawers built into the stairs to make creative use of every scrap of available space.